Have you ever thought of exploring crater Lakes while on safari in Uganda and you do not know where to go to? While Uganda is largely known for wildlife safaris, paying a visit to one of the Uganda’s spectacular Crater Lakes rewards travelers with the most breathtaking experiences. Most of these exceptional natural wonders can be sighted while you are on safari to Queen Elizabeth National Park, Kibale Forest National Park and at the base of the Rwenzori Mountain ranges. Interestingly, visitors can incorporate Crater Lake experiences with chimpanzee tracking adventures, bird watching, game drives, hiking, biking, swimming, fishing adventures and cave exploration. While you are on Crater trail, you will be amazed by the stunning areas in western Uganda as well as enjoy the most popular top of the world hike which takes visitors to most of the Crater Lakes, via the villages and tea plantations. 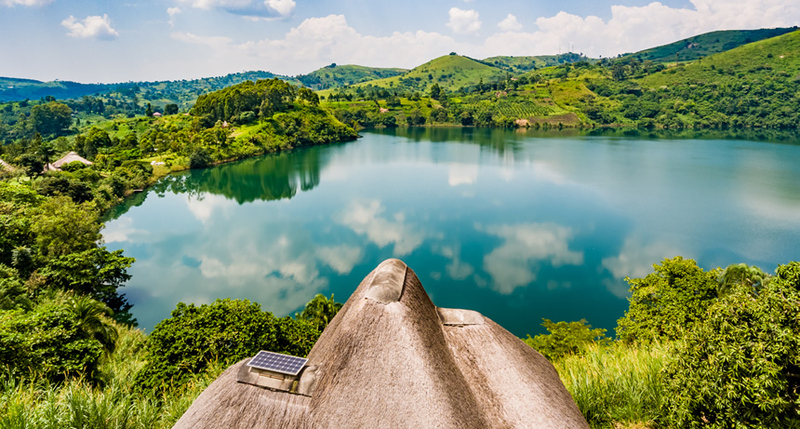 These Crater Lakes formed during the ancient volcanic activity that took place in Uganda about 8 to 10000 years ago much as they look very spectacular. At the time of explosion, they caused severe damage in the surrounding areas compared to what occurs with Mount Vesuvius. Fire and brimstone keeps erupting from these explosion crater lakes and the recent one being the 2000 BC while the pyramids in Egypt were being constructed. Any time you plan a Uganda wildlife safari to Queen Elizabeth National Park, a visit to Katwe Crater Lake should be a must for you. These spectacular natural wonders are situated in the north part of the Mweya Peninsula and at the highest point of the park. There is a scenic crater drive of about 27 kilometers which rewards visitors with the stunning views of the Crater Lakes. The area doesn’t feature much concentration of wildlife species but if you are lucky enough you will certainly spot out elephants and buffaloes that frequent to this area. There is also Lake Kitagata that is fed by a salty hot springs. A trip to this area rewards visitors with spectacular panoramic views of the western rift valley and its escarpments, the Rwenzori Mountain ranges, Lake George, Lake Edward and the natural Kazinga channel. 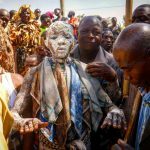 You however pay a visit to the magnificent Lake Katwe and its ancient salt works where you will also take a walk to adjacent local community. 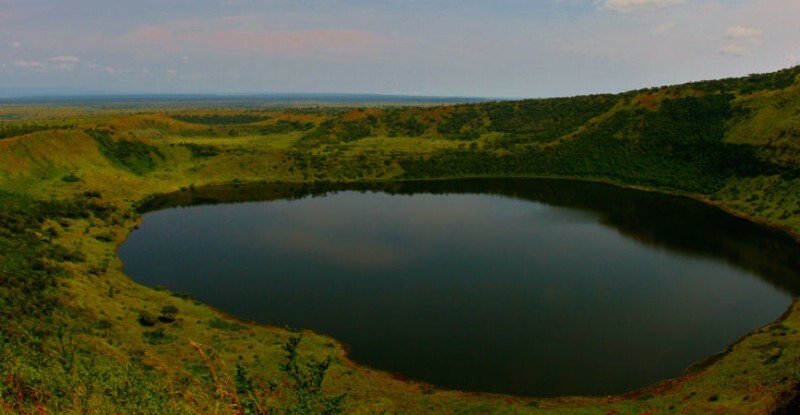 Situated along the Kicwamba escarpment of the western rift valley next to Queen Elizabeth National Park, Lake Nkugute is spectacularly stunning crater lake which can be sighted as far as Mbarara-Kasese route. There are also over 20 more Crater Lakes in this area as well as dry Craters. There are viewpoints where you can spot out Kicwamba rift valley and Queen Elizabeth National Park. These Crater Lakes are found next to Fort Portal and Kibale Forest National Park. Compared to the Crater Lakes in Queen Elizabeth National Park, Crater Lakes in Fort Portal can be visited while walking. There are also many hikes for visitors to undertake which come with amazing views of the Crater Lakes, the Rwenzori Mountain ranges, tea plantations, Lake George, Kibale Forest National Park and Kicwamba escarpment of the western rift valley. You can engage in various hikes with a guide. 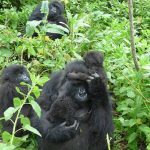 The Kasenda Craters are the best sites that you shouldn’t miss out in your bucket list if you are planning to pay a visit to Kibale Forest National Park for primate adventures. There is also Ndali Luxury Lodge and several budget lodges like the CVK Lakeside Resort, and Rweteera Safari Park all of which over viewing the Crater Lake within easy reach of several hikes on the Kasenda Crater Lakes. These Craters are located next to Fort Portal town and features as the smallest Craters in western Uganda. However, they come with magnificent surrounding that is worth exploring especially Lake Kyaninga and for a night stay, there is Kyaninga Lodge that offers spectacular views of the Lake Craters and the Rwenzori Mountain ranges. With the discussion above, Uganda boasts of its varied Crater Lakes that are widely distributed in various parts of the country. A visit to any of the Crater Lakes of your choice offers you opportunity to explore in depth how the Craters formed and also catch a glimpse at other incredible wildlife species. For tours to Kibale National Park and Queen Elizabeth National Park never miss to include one of the Craters in your bucket list and you will rewarded with breathtaking experiences of lifetime.